Giving column space over to non-alcoholic drinks might seem at odds with the name of this blog but then I’ve always left the door open to writing about any drinks-related topics that interest me, whatever their provenance. And in the case of Mr Fitzpatrick’s Temperance Bar in Rawtenstall, north of Bury in Lancashire, I’m very much interested. Mr Fitzpatrick’s is a temple (well, actually more like a chapel), dedicated to the 19th century temperance movement, an ill-conceived effort started by well-meaning religious types to persuade the ‘oi polloi away from the demon drink. Although temperance bars were once common in the north west of England, Mr Fitzpatrick’s is now the last of its kind. Opened in 1890, Mr Fitzpatrick’s unspoiled, uncomplicated interior of wooden counters and floors, jars of old-fashioned boiled sweets and other ingredients, is a piece of living history that might also provide ideas for the future, as a better alternative to modern soft drinks for those who can’t or don’t want to consume alcohol for whatever reason. The darker cordials, especially sarsaparilla and dandelion & burdock, appeal to the beer lover in me. Both of these drinks have a beer-like quality arising from their use of sometimes bitter or herbal tree barks, roots and other ingredients – typically those with purported “medicinal” properties – that lend them a somewhat similar “earthy” mouthfeel and drinking experience to beer even if the flavours are very different. Flavour-wise these kinds of drinks can be a little hard to describe, however, owing to the uncommonly used herbals. All I know is that I rather like them and have done since my mum introduced me to them as a kid, by which time they were already becoming uncommon. My favourite, and the one I tried first, was Mr Fitzpatrick’s Sarsaparilla, a traditionally-made sarsaparilla flavoured with the root extract of the Central American sarsaparilla vine. Mixed with sparkling water and served in a small cup, Mr Fitzpatrick’s version offered the typical sarsaparilla notes of liquorice and vanilla but was far less citric than more commercial versions I’ve tried (such as Baldwin’s Original Sarsaparilla), presumably because of more judicious use of citric acid. It was also considerably more authentic – most commercial versions today rarely use the ingredient the drink is named after. Bartender, make mine a sarsaparilla! The same is also true of the other temperance brew I sampled while on the premises; Mr Fitzpatrick’s Dandelion & Burdock, this time in an attractive handled glass. Again, the flavours of the two eponymous ingredients – again root extracts – are a little hard to describe without self-reference, liquorice is again evident, but dandelion and burdock is more medicinal and aniseed sweet than sarsaparilla (albeit much less so than American-style root beers that can be extremely “medicinal” due their use of the menthol-like wintergreen). 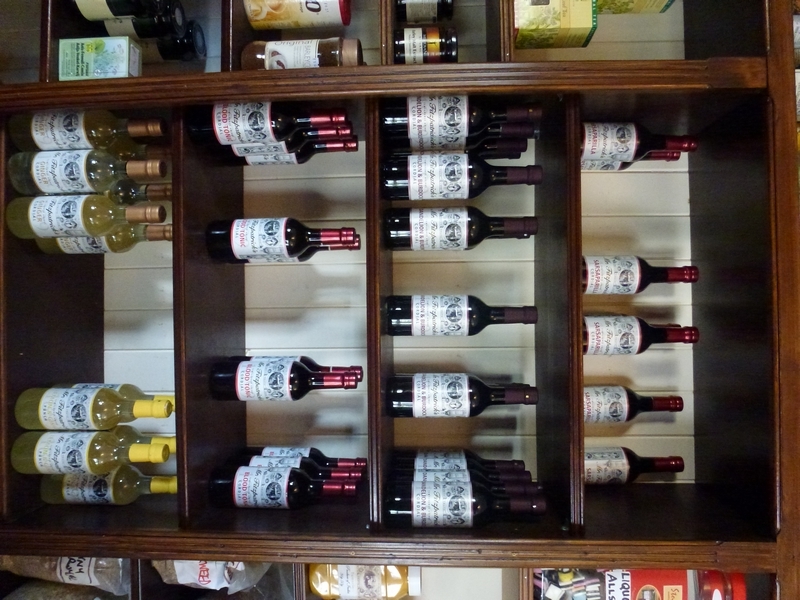 Sarsaparilla and dandelion and burdock are only two of the many temperance cordials available at Mr Fitzpatrick’s. Others such as the threateningly named, but actually raspberry-infused, blood cordial and lemon & ginger were also on the menu, along with another dark cordial (and one I’d never heard of previously) Mr Fitzpatrick’s Black Beer and Raisin, a bottle of which I took home for later consumption. 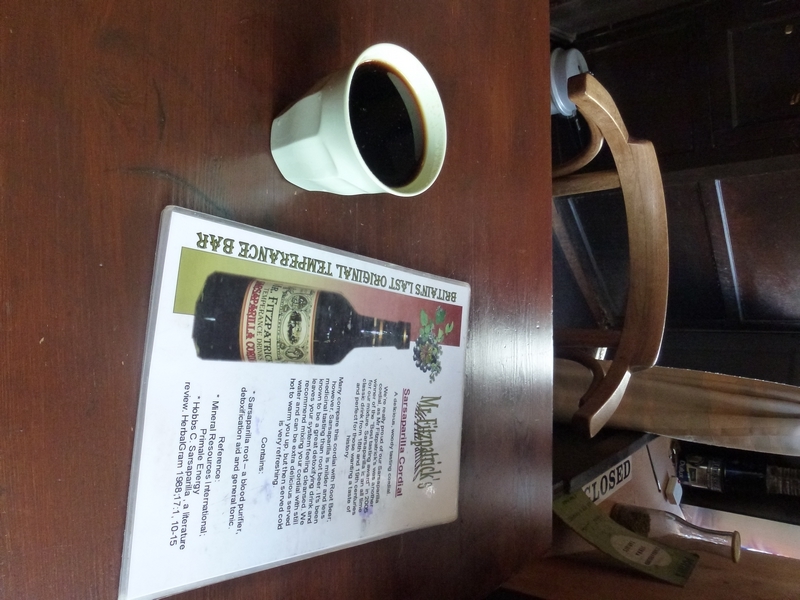 Quite different from the other dark brews sampled, Black Beer and Raisin offers a rich dark fruit experience against a darkly malty, rummy backdrop, especially when served hot as suggested on the label. While clearly neither a real beer nor alcoholic there’s a definite kinship to that endangered Yorkshire speciality, Mather’s Black Beer (which is alcoholic) in being made with malt extract. Few commercial versions of any of these drinks are readily available today, although Mr Fitzpatrick’s are available online here and in specialist stockists around the country. Similar sarsaparilla and dandelion & burdock cordials (as well as premixed sparkling versions) from Mawson’s of Bacup, Lancashire can also be found in Waitrose. Elsewhere, Fentimans has a pre-mixed dandelion & burdock while the aforementioned Baldwin’s Original Sarsaparilla cordial is cheaply available in many large Tesco stores, usually in the Caribbean section of the World Food aisle (sarsaparilla is still very popular in that part of the world I believe). If I have any issue with these temperance-era cordials it’s that they are generally a bit too high in sugar for me, if not nearly as sweet as many of today’s soft drinks (or, for that matter, alcopops). This makes them too sweet to consume more than a pint or two, somewhat reducing their appeal as genuine alternatives to beer or other fermented alcoholic drinks for those of without a sweet tooth. Whether it’s possible to create good quality sugar-free versions I’m not sure but I’d certainly consider drinking them if they were available. And even if they never are that won’t stop me enjoying the occasional glass of the full fat versions! With Mr Fitzpatrick’s reporting a 300% increase in sales in the last year it seems many more of us are looking to do the same.